A fantastic place to bird is the Semiahmoo Spit. It’s a great place to walk and you can bird both Drayton Harbor and Semiahmoo Bay. You can get breakfast, lunch or dinner at one of the restaurants at the Semiahmoo resort. Got up-close views of Harlequin Ducks and Surf Scoter. You might want to include Pt. Whitehorn Marine Reserve Park. It has a nice trail through the woods that always has some interesting species and then it has views out over the Georgia Strait with scoters, LT Duck, Harlequin, RB Mergs, hundreds of cormorants on the Cherry Pt. pier, and the possibility of Ancient and Marbled Murrelets in season. The port city of Bellingham is situated some 90 miles north of Seattle and 20 miles south of the U.S.-Canada border, between the Strait of Georgia and the North Cascades foothills. Nearby protected bays, deltas of the Nooksack River and several lesser streams, lowland lakes, and fragmented patches of forestland offer numerous birding opportunities. Migration (late April through May, late July through September) and winter are the most productive seasons. Influenced by outflows of arctic air from Canada’s Fraser River valley, the area has several winter records of Northern Hawk Owl and Great Gray Owl. Black Scoter and Snow Bunting are more easily found here than farther south in Puget Sound. Notable records of northern rarities include King Eider (Birch Bay; Bellingham Bay; Drayton Harbor), Hudsonian and Bar-tailed Godwits (Semiahmoo Bay), Thick-billed Murre (Drayton Harbor), and Brambling (Lummi Flats, January). Encompassing 2,700 acres of conifer forest with a sprinkling of Pacific Madrone and other broadleaf trees, Larrabee State Park (Discover Pass required) clings to the slopes of Chuckanut Mountain along the rocky shore of Samish Bay. Coming from the south on SR-11 (Chuckanut Drive), the park is about five miles north of the Samish Flats (page 112). Coming from I-5, take Exit 250 on the south edge of Bellingham, go west on SR-11 (Old Fairhaven Parkway) 1.3 miles to 12th Street and turn left to stay on SR-11. The road then veers left in about 200 yards onto Chuckanut Drive. The main park entrance is about five miles south, on the right. After the entrance station, swing left to the parking lot and short trail for the beach. In winter this is a good place to look for Harlequin and Long-tailed Ducks, Barrow’s Goldeneye, loons, Western Grebe, and cormorants (all three species). Occasionally Black Turnstone and Surfbird can be seen on the offshore rocks. At any season you may find Band-tailed Pigeon, Hutton’s Vireo, and an assortment of other Westside lowland forest species. Across the highway from the park entrance, a stiff hike up the Fragrance Lake Trail will give you additional exposure to forest habitats. 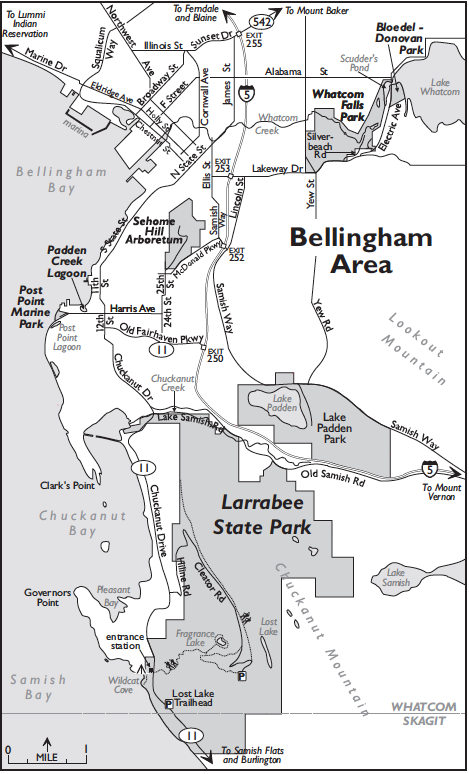 Travel south 0.5 mile on Chuckanut Drive and turn left into Larrabee State Park Lost Lake Trailhead parking area. The parking area, as well as the trails in the surrounding area are very good for woodpeckers, and spring flycatchers, vireos, warblers, and finches. To drive up the side of Chuckanut Mountain, return north 1.7 miles on Chuckanut Drive and turn right onto Hiline (Cleator) Road, which ends in 3.7 miles at an overlook from which you can see soaring Bald Eagles or other raptors when winds are favorable. This road, which turns into a dirt road with potholes and some rough spots, can be good all year but is best in spring and early summer. Much of the forest has been logged at different times in the past, and habitats are in various stages of succession. Stop often to look for Northern Pygmy-Owl, Barred Owl, Band-tailed Pigeon, and nesting flycatchers, vireos, chickadees, thrushes, warblers, sparrows, and finches. From the corner of Old Fairhaven Parkway and 12th Street, where SR-11 goes east to I-5 and south to Larrabee State Park, drive north three blocks, then turn west onto Harris Avenue. On the right in 0.2 mile, Padden Creek Lagoon is a good place in winter to look for saltwater ducks and gulls. In spring and summer, Green Heron can be found here. Continue another quarter-mile through the historic Fairhaven business district and turn left onto Post Point Road, which ends at Post Point Marine Park. Check the waters of Bellingham Bay for Harlequin and Long-tailed Ducks, scoters, both goldeneyes, Red-throated, Common, and even Yellow-billed (several records) Loons, Red-necked and Western Grebes, cormorants, Common Murre, Pigeon Guillemot, Marbled Murrelet, Ancient Murrelet (December and January), and Rhinoceros Auklet (well offshore). For Lake Padden, leave I-5 at Exit 252 northbound and turn right (south) onto Samish Way. Continue 1.8 miles to the west entrance of the park. From southbound I-5 Exit 252, turn left at the light off the exit ramp. Cross the overpass while moving into the right lane, turn right onto Samish Way, and proceed 2.0 miles to the park entrance. Parking is plentiful. Lake Padden is a 148-acre park with good facilities and a well maintained primary 2.6-mile loop trail around the lake. There are an additional 5.1 miles of secondary trails veering off the primary loop trail. Habitats include mixed deciduous/coniferous forest, a lake, and open fields around the lake. Birding on the lake from the main trail is best during winter, spring, and fall. The lake attracts many waterfowl in winter and spring, including Ring-necked Duck, Common Merganser, and Ruddy Duck, and an occasional Redhead or Canvasback. Spring songbird migrants are numerous and more abundant on the quieter secondary trails. Osprey, Bald Eagle, and Barred Owl frequent this park and can be viewed from the main trail. No permits are required. For Whatcom Falls Park, leave I-5 at Exit 253. Travel east 1.5 miles on Lakeway Drive and turn left onto Silverbeach Road (just past the Bayview Cemetery). An entrance to the park is about 0.2 mile from this intersection, on the left. A second entrance is reached by continuing on Lakeway Drive about 0.2 mile past Silverbeach Road to Electric Avenue. Turn left onto Electric Avenue and left again at the entrance in about 300 yards. Birding is good year round in the woods and along Whatcom Creek, which bisects the park with several wetlands. Look for American Dippers below Whatcom Falls. Nearby Bloedel-Donovan Park, at the northwest end of Lake Whatcom, is 0.8 mile north of Lakeway Drive on Electric Avenue. During winter, look for waterfowl and gulls. In spring, Wood Ducks, Hooded Mergansers, and Virginia Rails nest at Scudder’s Pond, on the west side of Electric Avenue 0.1 mile farther north. Watch for Beavers and signs of their activities. These and many other Bellingham parks are interconnected by an excellent series of trails, which birders will enjoy exploring. 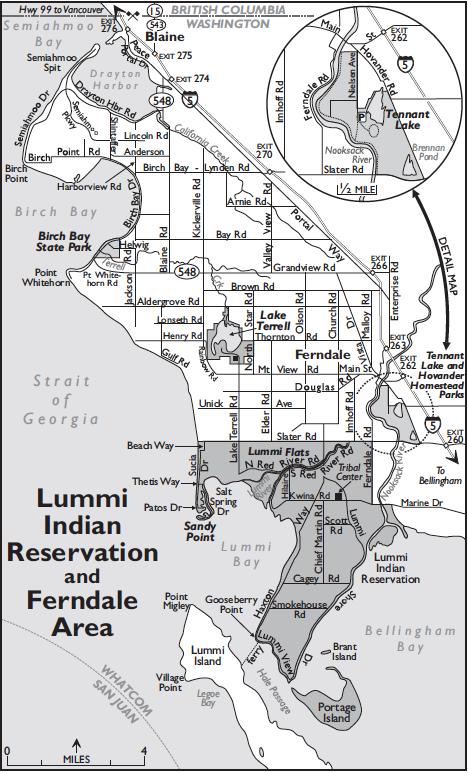 The birding sites described in this section are within the boundaries of the Lummi Indian Reservation and subject to the laws of the Lummi Nation. A Letter of Permission, good for one year, is required to bird on tribal lands (other than paved county roads). This letter is free and may be applied for, in person, during weekday business hours through the Lummi Planning Department, Lummi Business Council Building, 2665 Kwina Road, east of Haxton Way. Call well ahead for details and to arrange Letter of Permission pick-up (360-384-2307). Be respectful of private property; bird from the roadside. No foot or vehicle access is allowed on the Aquaculture Dike or on the tidelands. Drive west on Slater Road from I-5 Exit 260, crossing the Nooksack River in 1.6 miles. Continue another 0.6 mile to the intersection with Ferndale Road, the northeast corner of the reservation. Go left (south) 1.9 miles on Ferndale, then turn right onto Marine Drive. After 0.8 mile, veer to the left from Marine Drive onto Lummi Shore Drive. The road soon approaches Bellingham Bay and bends a bit to the right, with a view of the Nooksack River delta on the left. Over the next few miles, Lummi Shore Drive follows the northwest shore of the bay. Stop at the many pullouts to look out over the delta and the river mouth. Geese, swans, herons, and Bald Eagles are often abundant, but you will need a scope to get good views. Loons, grebes, saltwater ducks, and gulls are common in Bellingham Bay. At 6.4 miles from Marine Drive, Lummi Shore Drive makes a right and becomes Lummi View Drive, and for the next 1.7 miles follows the shoreline of Hale Passage with Lummi Island across the channel. Check along the channel, particularly at Gooseberry Point near the ferry terminal, for Brant, loons, Red-necked Grebe, Greater Scaup, scoters (including Black), Common Murre, Pigeon Guillemot, Marbled Murrelet, and Rhinoceros Auklet. This is also a good location to look for jaegers (usually Parasitic) during fall migration. Lummi View Drive curves right, past the ferry terminal and becomes Haxton Way. Short-eared Owl is regularly seen along Haxton Way, between Kwina Road and South Red River Road. Continuing north, in 5.9 miles you reach South Red River Road and the edge of the Lummi Flats. These low-lying, fertile fields on both sides of the Lummi River—part of the Nooksack delta system—are among the best birding areas around Bellingham. Swans, hawks, owls, falcons, and shrikes and other passerines, are abundant on the flats in winter (the best season). Drive any of the roads to check wet spots for shorebirds (spring) and blackbirds (Rusty possible fall–winter). South Red River Road, with a low volume of traffic, is the most leisurely road for birding. In late evening, Harlan’s Hawks can found here. Winter sparrows use the hedgerows bordering the slough; check finches feeding on the alder cone crop for redpolls (one record of Brambling). Areas of open ground such as those at the west end of Kwina Road can be productive for American Pipits, Lapland Longspurs, and there is one November record of McKay’s Bunting. From South Red River Road, go north on Haxton Way for 0.6 mile to Slater Road. Turn left (west), drive 3.6 miles, and turn left onto Beach Way. In 1.3 miles, after curving right onto S Beach Way, turn left onto Sucia Drive. Drive one mile, turn left onto Thetis Way. When you come to the T, turn right onto Salt Spring Drive to Sandy Point, a gravel spit at the northwest end of Lummi Bay. Look for scoters, loons, grebes, and shorebirds. An Osprey pair nests on a platform in the bay to the west. Jaegers have been observed here, as well as Snowy Owl during irruption years. Tennant Lake, along the Nooksack River south of Ferndale, is at the heart of a 720-acre tract jointly administered as a county park and a state wildlife area. Varied habitats make this an excellent birding site at any time of year. An observation tower and a boardwalk through a cattail marsh to the lake provide opportunities to view Green Herons, waterfowl, and raptors. Other trails run south and west through grasslands, wetlands, and deciduous forest. The boardwalk and the area around the lake are off-limits to all but hunters from mid-September into January. From I-5 Exit 262, go west 0.5 mile on Main Street to Hovander Road. Turn left, drive 200 yards, then take the second right onto Nielsen Avenue and continue 0.9 mile to the parking area for the visitor center, on the left (the first right from Hovander goes to a WDFW boat-launch area on the river). From the Lummi Flats the site is easily reached by following Slater, Imhoff, and Douglas Roads to Main Street. Lake Terrell Wildlife Area, established in 1947, offers 1,500 acres of open water, marshlands, grasslands, and mixed deciduous/coniferous forest. Hunting is allowed here, so the best times to visit are spring into September when you will find a good variety of waterfowl, marshbirds, swallows, and other songbirds. From Ferndale, head west on Main Street, which becomes Mountain View Road. In 4.5 miles, turn right onto Lake Terrell Road. Continue 0.8 mile to the parking lot (Discover Pass required to park). Or go north from Slater Road on Lake Terrell Road (2.4 miles west of Haxton Way) to reach the parking lot in about three miles. Common Loons nested at Lake Terrell through 1987, and alternate-plumaged individuals are still occasionally observed during the breeding season. Look for Trumpeter Swan, Wood Duck (nesting), Canvasback, Redhead (late winter and spring), Hooded Merganser, and Ruddy Duck. Lake Terrell regularly attracts unusual passerines in spring and fall, among them Least Flycatcher (one record), Bank Swallow, House Wren, American Redstart, and White-throated Sparrow. From I-5 Exit 266, follow the signs for Birch Bay State Park west along Grandview Road for eight miles, turn right onto Point Whitehorn Road. Continue 0.6 mile north to Birch Bay Drive. If you wish to bird the forested area above the waterfront, turn right 0.1 mile after entering the park and walk the half-mile Terrell Marsh Trail through some of the park’s 193 acres of lowland forest, looking and listening for the usual woodpeckers and passerines. Wood Ducks and Hooded Mergansers can often be found in the fresh- and saltwater marsh habitats at the estuary of Terrell Creek. Otherwise, for the next 1.4 miles you are in the state park (Discover Pass required). The best waterbirds are found beginning at the south end of the park and continuing up Birch Bay Drive to the picnic area across from the public restrooms. This is an excellent winter viewing area for Brant, Harlequin Duck, scoters (all three species), Long-tailed and Ruddy Ducks, Red-throated and Common Loons, Horned, Red-necked, Eared (uncommon), and Western Grebes, alcids, gulls, and terns (especially on the beaches in town). Western Sandpipers and other shorebirds occur in spring migration along the shoreline, and Dunlins winter in good numbers. Drayton Harbor, a large estuarine bay isolated from Semiahmoo Bay by Semiahmoo Spit, is one of the most important winter waterbird sites in the state. If you are coming from I-5, take Exit 270 and go west on Birch Bay-Lynden Road for about four miles, then turn right (north) onto Harborview Road, which intersects Lincoln Road in 1.0 mile. Turn left and follow Lincoln (becomes Semiahmoo Parkway at Shintaffer Road) to the end to access the spit. If you are coming from Birch Bay, turn right from Birch Bay Drive at the north end of the bay onto Shintaffer Road (3.5 miles from the intersection of Birch Bay Road and the state park road). In 0.6 mile, follow the Semiahmoo sign by turning left onto Semiahmoo Parkway. A resort occupies the tip of Semiahmoo Spit; however, a county park extends about two-thirds of the length of the spit from the base, giving good views of Drayton Harbor on the inside and of Semiahmoo Bay to the north. There is convenient parking at both ends of the park. In winter this is an excellent place to view Brant, dabbling and diving ducks (including all three species of scoters), loons, grebes, cormorants, Black Oystercatchers, Sanderlings, Dunlins, alcids, and gulls. Ospreys, Bald Eagles, and Peregrine Falcons use the spit. Lapland Longspurs and Snow Buntings also are occasionally sighted here. At the opposite corner of Drayton Harbor, look through the many ducks at the mouth of California Creek for an occasional Eurasian Wigeon. To get there, leave Semiahmoo Spit by turning left at the top of the hill onto Drayton Harbor Road. Stay left for 3.1 miles around Drayton Harbor to a small gravel lot on the left before the bridge which affords a view of the mouth of California Creek. A variety of waterfowl can be observed here, along with resident Belted Kingfishers. 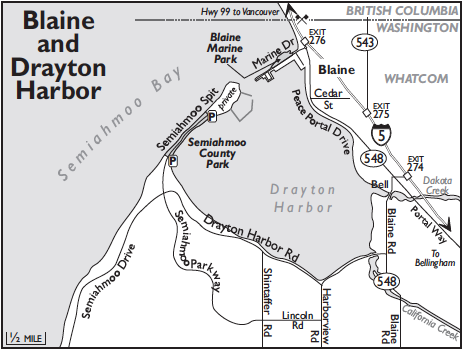 Continue on Drayton Harbor Road for 0.1 mile and turn left onto Blaine Road. Go north for 0.9 mile to Peace Portal Drive. Turn left here and drive 1.4 miles to the intersection with Cedar Street in Blaine. Park and cross the road. A bluff above the railroad tracks provides a panoramic view of the harbor. Look for Brant and diving birds. Whimbrels (late April–May), Marbled Godwits, Caspian Terns, and other shorebirds may be present on an incoming tide. Another good viewpoint is the parking lot behind the Red Caboose, a few blocks farther north. Blaine Marine Park, at the mouth of Drayton Harbor within sight of the Peace Arch and the U.S.-Canada border, affords closer views of the same species as at Semiahmoo Spit. Continue north through the four-way stop to the first traffic light on Peace Portal Drive and drive three-fourths of the way through the roundabout, exiting onto Marine Drive. (From I-5 northbound, take Exit 276, cross under the freeway, and continue halfway through the roundabout, exiting onto Marine Drive. Southbound from Canada, take the Blaine City exit and follow the roundabout to Marine Drive.) Marine Drive goes out a spit for two-thirds of a mile, terminating at a fishing pier at the entrance to Drayton Harbor. The pier is a good spot for observing Harlequin Duck, Barrow’s Goldeneye, cormorants, and (in spring and fall) Caspian and Common Terns. Across the channel, Harbor Seals haul out onto the concrete breakwater at the end of Semiahmoo Spit. Waterbird viewing from the fishing pier is good at any tide level. The tideflats on the north (Semiahmoo Bay) side of Marine Drive often have impressive numbers of shorebirds, conveniently viewed from a paved promenade atop the low bluff along the edge of the bay. Shorebirding is best near the base of the spit as the incoming tide pushes the feeding birds toward shore. Besides the species expected for Washington’s inland marine shorelines, uncommon species and even rarities have turned up here during spring and fall migration, including Whimbrel, Hudsonian (rare), Bar-tailed (rare), and Marbled Godwits, and Red Knot.